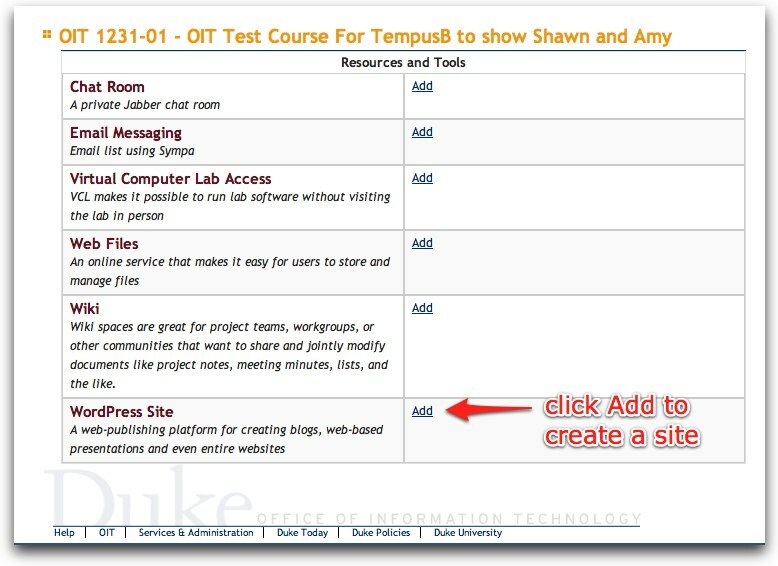 The instructions below are designed for faculty and instructors creating a site for an official Duke course. To create a site for non-course use, follow these instructions. Faculty and instructors can use a Duke tool called “Toolkits” to quickly create a WordPress site for a course. Creating a site using Toolkits will also add all of the enrolled students in the course to the WordPress site as authors. 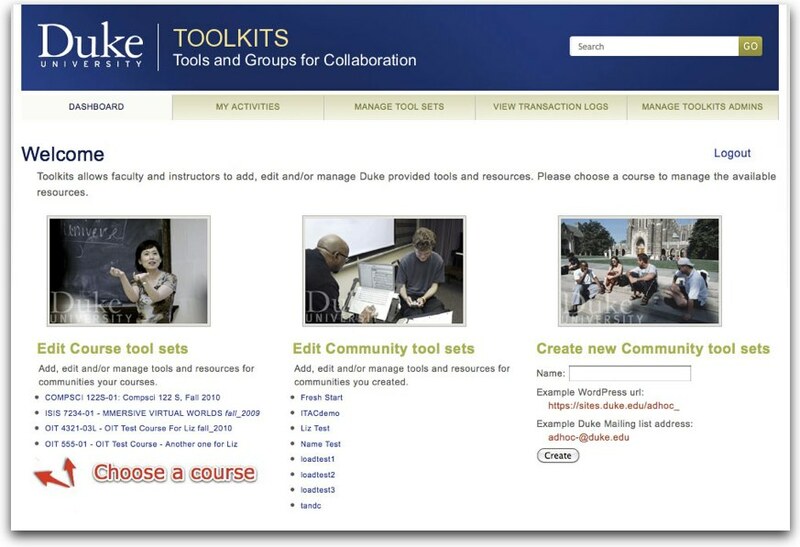 Visit the Toolkits site: https://toolkits.oit.duke.edu and login with your Duke NetID. Once you’ve logged in, a list of courses will appear. 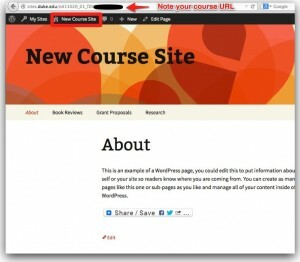 Choose the course you want to create a WordPress site for from the list. Find the WordPress Site box, and click ‘Add.’ This will begin activation of your WordPress site. Before you can access your site, you’ll need to read and agree to the Duke Instructor’s Agreement. You can refer to a copy of this agreement anytime on our Policies page. 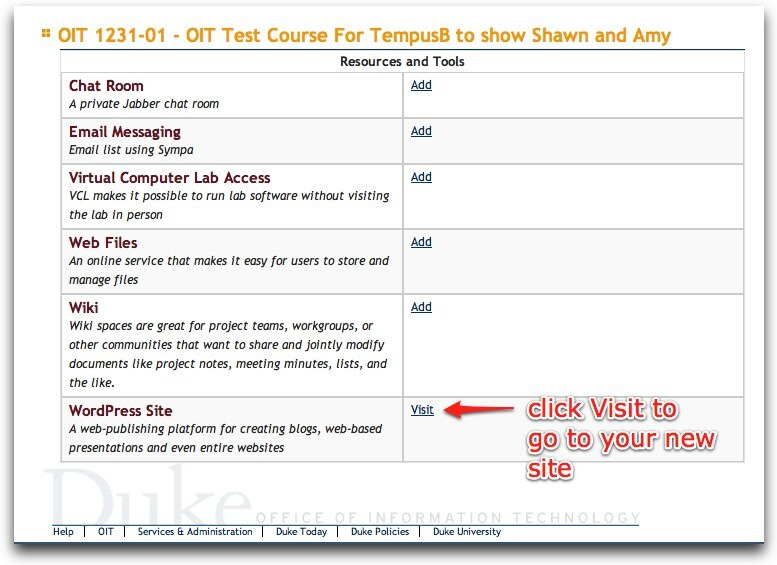 You should now have access to your new Sites@Duke site for your course. Go to the name of the site (To the right of the house icon on the toolbar) to get to the dashboard and begin modifying your site. You may also want to note the URL (web address) for your site – which will begin with http://sites.duke.edu/ and end with your course info. This is the link you’ll want to send to your students so they can find your course. If you have more than one site in the system, you can choose ‘My Sites’ under the Dashboard tab to find a list of all available sites. Choose Visit to view your site, or Dashboard to start creating and editing.